This is going to be long road trip, so buckle up your seatbelts and hold on tight! The story begins when my parents got a cockatiel on Craigslist ever since my little sister stumbled on a brunch of videos of them on YouTube. However, the responsibility was push onto me when they found out the cockatiel was untamed, and was on a seed-only diet. For a 15-year-old girl, that’s a lot to take in. The previous owner kinda gave up on the poor guy because they didn’t have time for him anymore, and by the way he acts, it was obvious that he was brought from a pet store and had zero human interactions, besides the changing of the food and water dishes. The owners told us that he was a year old and that he was aggressive/terrified towards hands since one of their relatives tried to pick him up. Key word: tried. Well, the only experience I have with birds is that I been owning a parakeet since last November, so I’m still a beginner. So far I gotten him to eat millets, seeds, and a few different types of pellets from my hand, although he’s somewhat nervous when he does. So the problem is that I have no idea what I should be doing. I don’t know how much time I should be training him, or what taming methods I should be doing. I don’t even have a constant routine to tell me when to train him. When I was taming my budgie, I wasn’t afraid of her bites, but it’s a different story for my cockatiel. I gotten bitten a few times, but they never bled, nor were they powerful. However, I do know what damage they could do. I heard that you could use gloves while taming them, but I rather have him used to my hands than wear gloves every time I handle him. 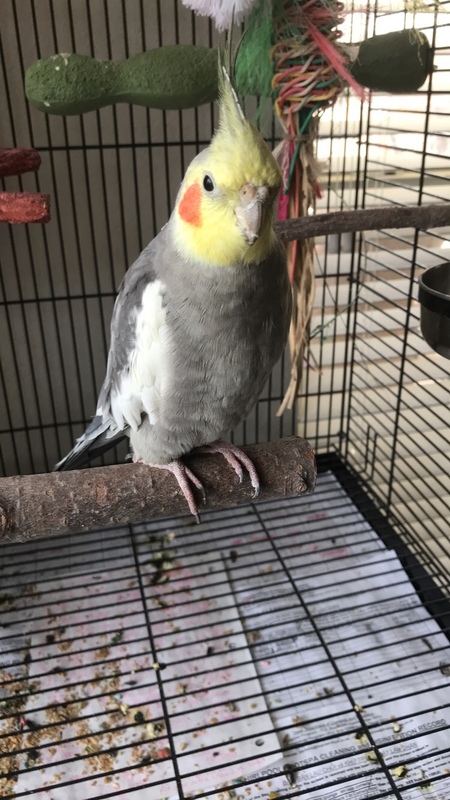 I know training a older cockatiel that never been tamed before wouldn’t suddenly be tamed, but I honestly don’t know what direction I should be going with him. I had him for a month now and he seems more relaxed since I got him. He occasionally follows me from the inside of his cage, and waits at the door when I hand him treats. He’s a sweet boy and has so much potential if he was looked after more. He has gone though a lot since he came, and I want to do what I can for him. If you have any methods/tips for taming an older bird please reply! Sorry if there’s any grammar mistakes, it’s 11PM when I typed this. Last edited by love4beauty; 04-11-2018 at 04:20 AM. Hello and welcome to PP. Peabo looks really cute, if a tad mischievous. If Peabo has not had much interaction with humans I would start by getting him used to you without handling him. Just sit by the cage and talk or read to him. Wait for him to make the first moves towards wanting to be with you - it might take a few days or even weeks but you will recognise the body language. If you need him to be out of the cage for cleaning etc then get a small perch for him to step up onto. Don't just hold it in front of him, you might frighten him, let him get used to it without rapid movements. Talk to him while you are doing things in the room he is in and explain what you are doing so he gets used to your voice. It all takes time and patience but is richly rewarded. Last edited by Casper's 2nd best friend; 04-11-2018 at 08:49 AM. Hi and welcome to the forum! What you are doing is great. I agree to teaching him to step up on a perch. Try to make it the same as what he has in his cage. It will make the transition easier. Take his favorite food/treat and use it by holding halfway down the perch and see if he will step on the perch. This may take a few weeks to accomplish and I would just try it a couple of times a day so as not to stress him out. The fact that he is interested in you and follows you around is a good first step. Keep up the good work! Welcome from us as well. Peabo is a fine looking cockateil. How wonderful that you decided to take care of him. There are a few methods on the internet about how one can tame a bird, but before you decide which method would work out for you I think it would do you good to decide what time or times of the day and how long you have to devote to him. Routine is something a bird does well with along with other companions we share our days with. Heck, I like routines myself, it helps keep things in an order of sorts. I agree about not wanting to use a glove, as it can make Peabo more afraid. When our Lady came to live with us we set her cage up in the living room and let her observe us. As you probably already know sudden movement and loud noises can startle them as they do us. If you continue taking small steps to gain his trust and let him see that you are not to be feared he will adjust.